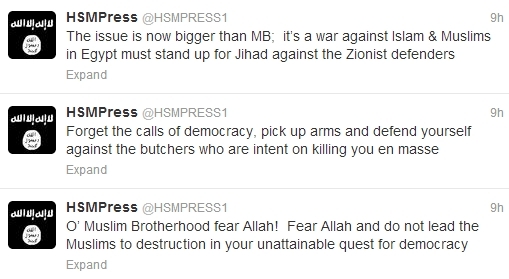 In a series of tweets posted to its official Twitter account today, Shabaab commented on the ongoing crackdown on the Muslim Brotherhood in Egypt. The jihadist group had previously chastised the Muslim Brotherhood on Twitter following the ouster of Mohammed Morsi in early July. Here are today’s tweets reproduced in paragraph form. The massacre in Cairo is a clear testament that the Egyptian army is not anything Egyptian but rather Jewish both in dialogue and deed. Their [The Egyptian army’s] rifles are more accurate when it comes to killing innocent Muslims than when aimed at the Zionist occupiers of Muslim lands. We tell our Muslim brothers in Egypt that these are your enemies and not Egyptian soldiers, so you have the right to defend yourself & fight. 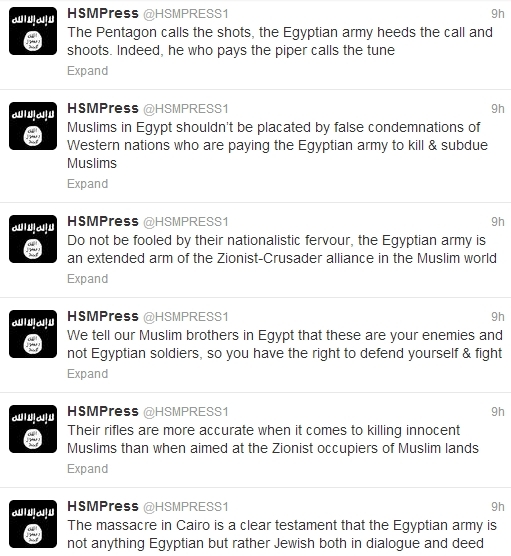 Do not be fooled by their nationalistic fervour, the Egyptian army is an extended arm of the Zionist-Crusader alliance in the Muslim world. Muslims in Egypt shouldn’t be placated by false condemnations of Western nations who are paying the Egyptian army to kill & subdue Muslims. The Pentagon calls the shots, the Egyptian army heeds the call and shoots. Indeed, he who pays the piper calls the tune. O’ Muslim Brotherhood fear Allah! Fear Allah and do not lead the Muslims to destruction in your unattainable quest for democracy. Forget the calls of democracy, pick up arms and defend yourself against the butchers who are intent on killing you en masse. The issue is now bigger than M[uslim] B[rotherhod]; it’s a war against Islam & Muslims in Egypt must stand up for Jihad against the Zionist defenders. And on Aug. 15, Abu Hafs al Maqdisi, the leader of the Gaza-based Jaish al Ummah (Army of the Nation), called on Egyptians to wage “jihad” against Egyptian army commander General Abdul Fattah el Sisi.